I went to college with a girl whose parents taught her to say that line when she was very very little … they would trot her out in front of dinner parties, past her bedtime, to do just that. What is the first line of Gravities Rainbow? What is Pynchon’s Gravity’s Rainbow? 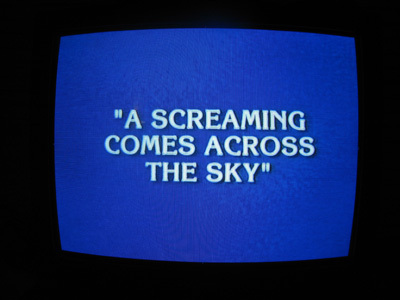 You were so happy to see a Pynchon reference on Jeopardy, weren’t you? haven’t read it yet, but will now. Love you.